One of the things that impresses me about Lean done right is that there is no need for a “change management” program. Change management programs are a structured process whose intent is to achieve lasting organizational change. But they almost never do because it is complex, confusing, and transparently self-serving. While intentions are good, outcomes are normally very poor. I sometimes see organizations try to execute a change management program while at the same time they try to adopt Lean management. Change management programs are for organizations whose leaders favor zero-sum (win-lose) outcomes, usually for the purpose of expediency, in an effort to try to get employees to accept outcomes that are bad for them but good for the company and its shareholders. That outcome assures the failure of both change management and Lean. Change that results in harm is not change for the better, as required in Lean management. 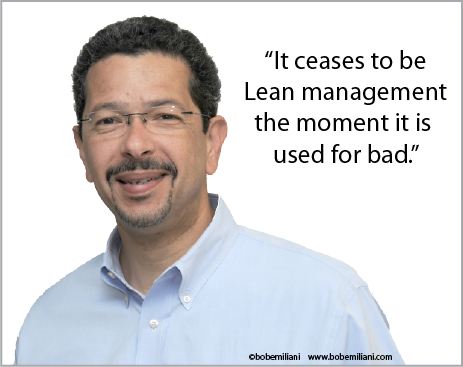 Remember this: It ceases to be Lean management the moment it is used for bad. Change management does not make zero-sum outcomes go down more smoothly for those employees who are directly and indirectly affected. What employees want, as do other stakeholders, is non-zero-sum (win-win) outcomes. Nobody wants to be the loser. It is the responsibility of highly compensated business leaders to rise to that challenge and deliver. Think of it this way: You don’t need a change management program to learn how to play piano. You need, at minimum, to develop the discipline for daily practice. More will be learned through careful study of music. The same is true for Lean. Everything flows from that. Lean management, itself, is daily change management. There is no need to layer a change management program on top of Lean. The leaders of an organization are far better off learning the difference between REAL Lean and Fake Lean than they are trying to deploy change management and adopt Lean management at the same time. Understanding difference between REAL Lean and Fake Lean is what matters most if successful outcomes are desired. Is there a case for Change Management being useful in non-Lean contexts? Usually CM is used for driving big, bloated top-down IT projects into corporations, and CM staff is used to train people on the new system, as well as to help them adapt (with as few tears as possible) to the new way of working that the new system requires. While a Lean/Agile bottom-up approach to system development (e.g. involving end users in the design, and building iteratively in a PDCA cycle) should obviate a lot of CM when it comes time to launch the system in full-scale production, I can still see a case for training when the system is going to affect thousands of users. Wondering what your thoughts are. Hi ken – I think change management consumes resources without providing any tangible value. People’s efforts are better spent on the actual of work of making improvements quickly using a process such as Toyota’s kaizen method.